German Heinkel He-219 A-7 (A2/5/7) "UHU"
The Heinkel He 219 Uhu ("Eagle-Owl") was a night fighter that served with the German Luftwaffe in the later stages of World War II. A relatively sophisticated design, the He 219 possessed a variety of innovations, including Lichtenstein SN-2 advanced VHF-band intercept radar, also used on the Ju 88G and Bf 110G night fighters. It was also the first operational military aircraft to be equipped with ejection seats and the first operational German World War II-era aircraft with tricycle landing gear. Had the Uhu been available in quantity, it might have had a significant effect on the strategic night bombing offensive of the Royal Air Force; however, only 294 of all models were built by the end of the war and these saw only limited service. Ernst-Wilhelm Modrow was the leading night fighter ace on the He 219. Modrow was credited with 33 from 34 night air victories on the type. The 219 A-7 was a improved night fighter version, powered by two 1,800 PS DB 603E engines, 210 ordered as of 30 November 1944. The kit comes in a tray and lid type box that is not shrink-wrapped. 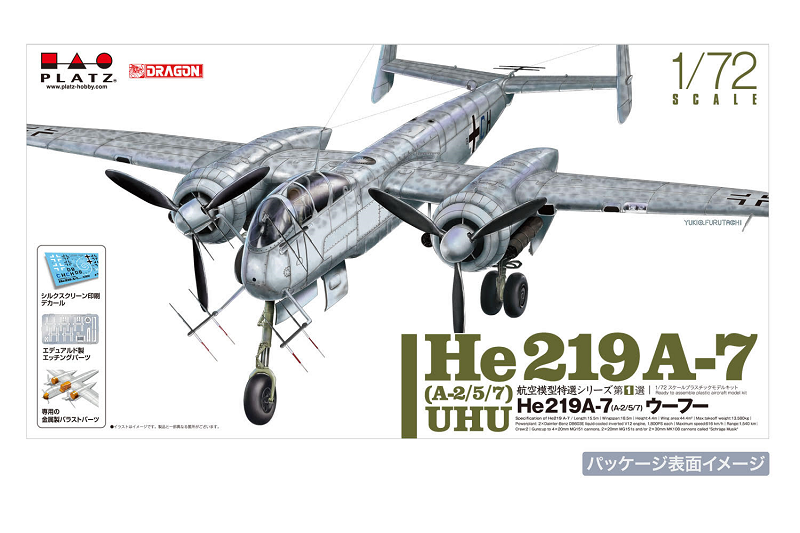 The box art shows a He-219A-5 posed against an all white background. Similar to how Tamiya does the majority of their box arts too. It is overall light-grey with medium-grey mottle pattern. The fuselage code is black + CH. It has skeletal black German crosses above the wings. One corner of the box art has a one-paragraph history of the aircraft. The other corner has 3 illustrations showing the decal sheet, PE fret and a repeat of the box art with all Japanese captions. 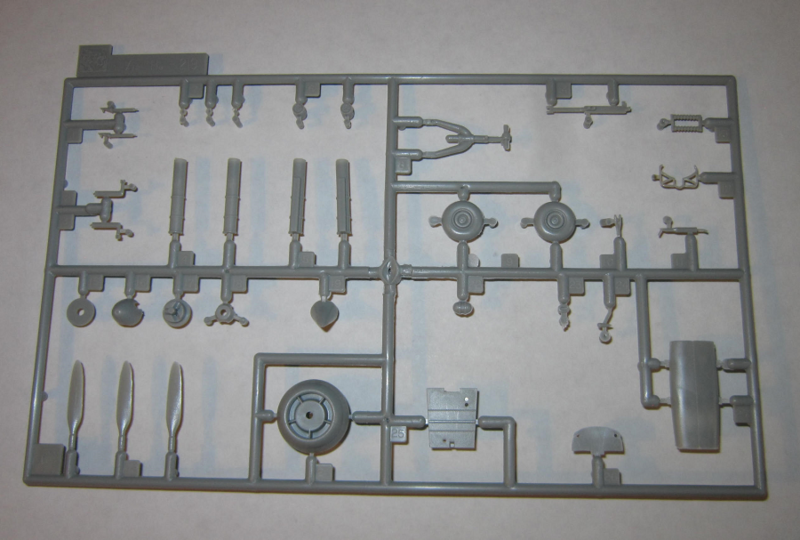 ​One side panel of the box says: This is a plastic unassembled model kit, glue and paint are not included, some parts are extremely sharp, handle carefully. 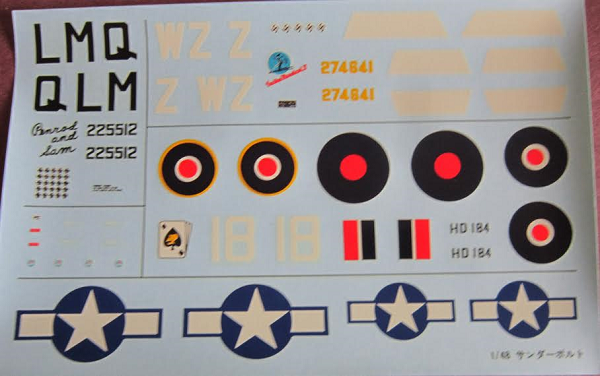 Do not use near fire when using glue or paint, suitable for modelers 15 and above, in Japanese, English and French, followed by 2 color photos of the model made up in the cover art scheme, with Platz's web address provided. undercarraige. The fuselage code is a small white G9 + and white outlined large T and a large solid white H.
It is with 1/NG.1, with white serial no. 230123 on the rudder. 2. 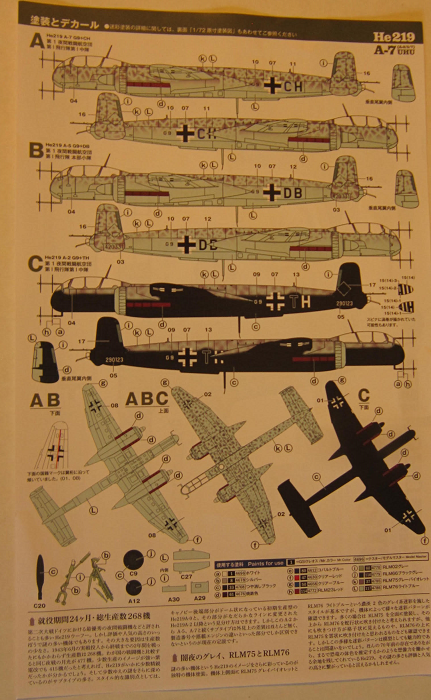 A He-219A-5 in the box art scheme. 3. 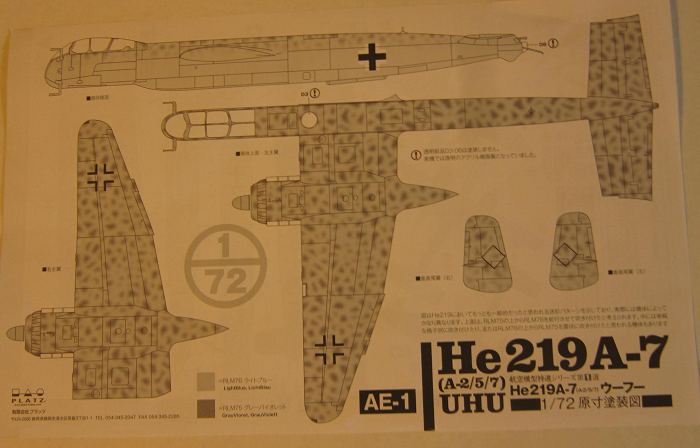 A He-219A-7 that is the box art subject (already described above) Black serial no. 420331 on the rudder. Copyright of the kit is given as 2016, with Platz's web address, telephone and FAX numbers. 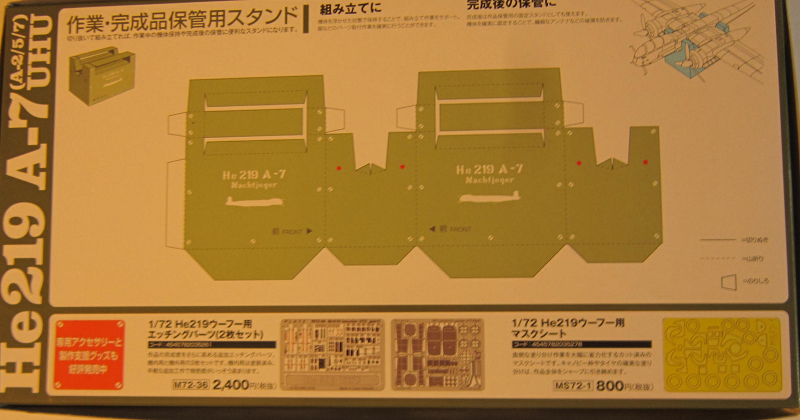 ​The sides of the tray repeat large color side views of the box art subject and the He-219A-2 night fighter. ​The bottom of the box has a cardboard support to hold the model while building it, to cut out with a scissors and assemble. The instructions for this is all in Japanese only, over illustrations of 2 other PE frets for this model that are sold separately by Platz (set no. 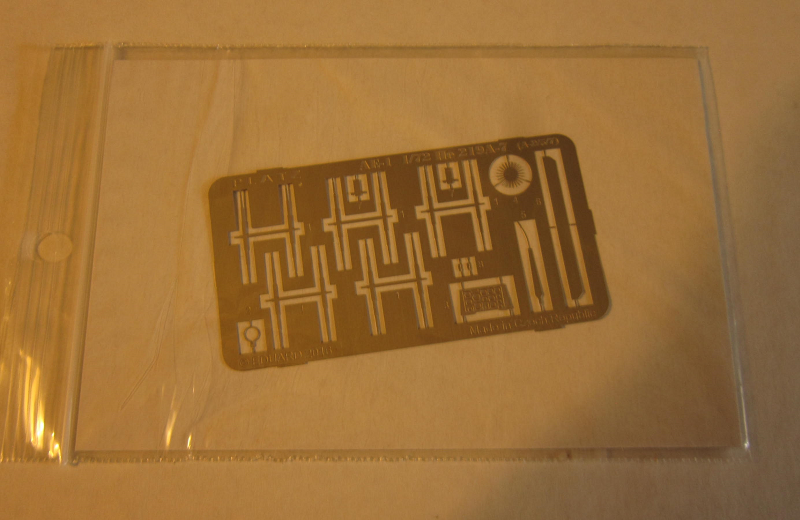 M72-36 2400) and the brass PE fret that is included in this kit. This kit holds 4 medium-grey trees and a clear tree in 3 sealed clear cello bags, white metal nose weights in a cello, PE fret in a zip-locked cello with a stiff card to prevent it bending, inside a sealed cello with the decal sheet and 2 instructions. The main instructions consists of a single-sheet that is folded in the center to create 4 pages in 7" x 11 3/4" page format. 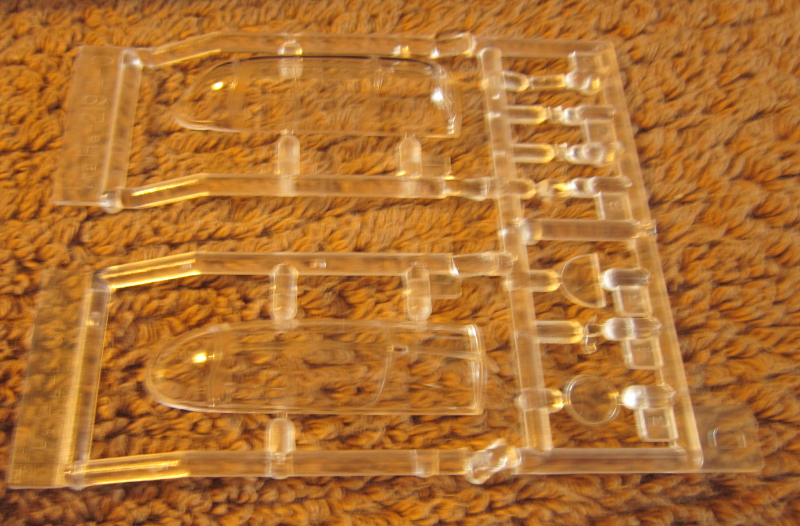 Page 1 begins with: This is an unassembled scale model. Glue and paint are not included. Some parts are extremely sharp, handle carefully, with Platz's telephone and FAX numbers in English and Japanese, over the parts trees illustrations and 3 illustrations of how to use the cardboard support stand in Japanese only. Page 2 & 4 gives 13 assembly steps that are alphabetized and not numbered like usual in kits. The second instructions is a single-sheet printed on slick coated paper in color. 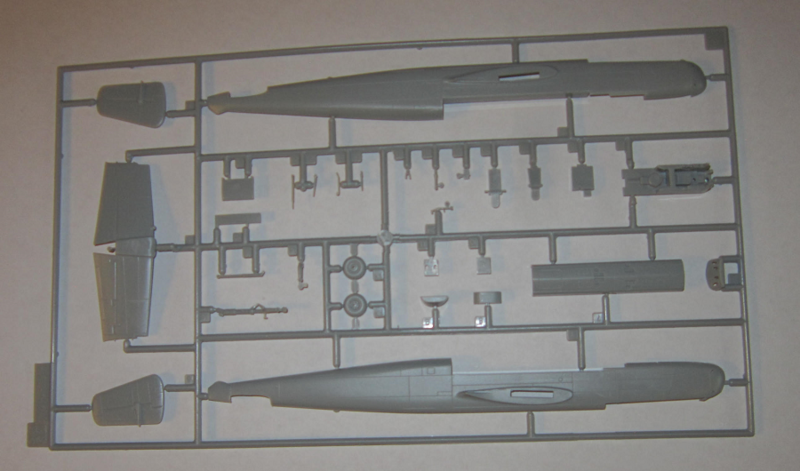 One side has a 4-view in 1/72nd scale, showing the He-219 in light-grey with dark-grey mottle and just a German cross on the fuselage sides, with Japanese text and Platz's telephone and FAX numbers repeated again. ​The reverse side is the painting and marking instructions. showing the 3 schemes (already described above), over a suggested paint color listing of Mr. Color and Model Master brands of hobby paints with a lot of Japanese text. ​Trees are alphabetized and have part number tabs on them next to the parts. Medium-grey letter A tree holds: fuselage sides and floor, elevators and rudders, nose gear leg etc. (29 parts) Five parts are shaded-out in the part trees illustrations as being excess and not needed to complete the model. ​There are 2 identical medium-grey letter C trees. 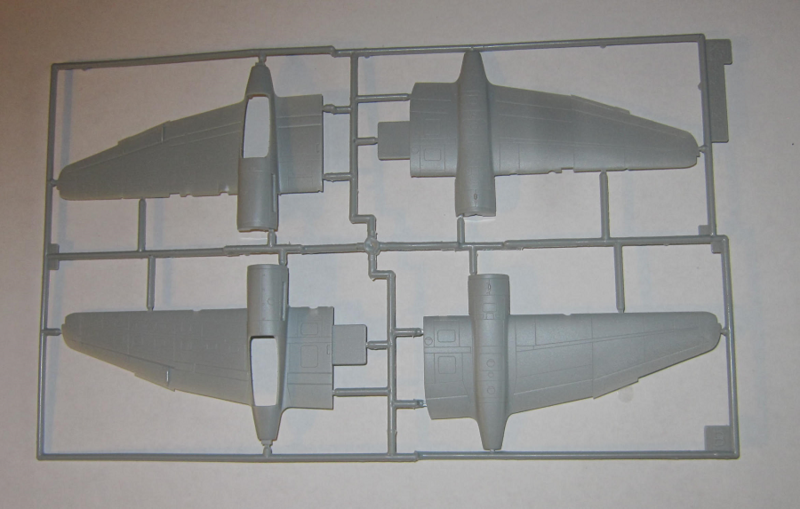 They hold: the main wheels, propeller blades and spinners, main gear legs, nose wheel compartment doors etc. 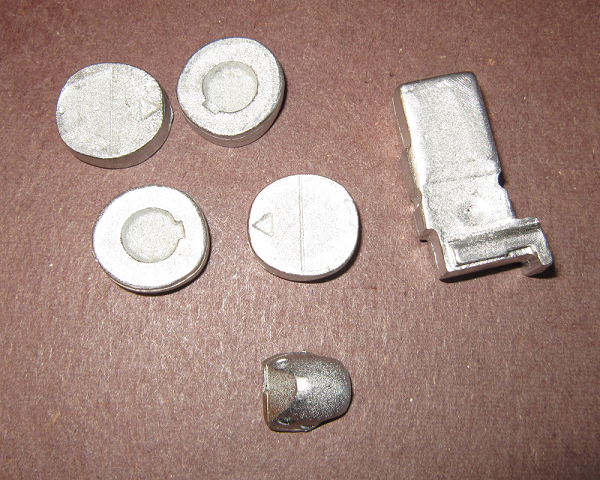 (36 parts) Three parts are excess. ​The clear letter D tree holds the cockpit canopy, windows and wing light lenses (9 parts) One part is excess. ​Letter W is the white-metal nose weights (7 parts) These are used to keep the aircraft on it's tricycle landing gear and not tipping on it's tail. Great inclusion. ​There are no crew figures.